RIGHT OFF THE bat, moderator Chris Wallace asked Hillary Clinton and Donald Trump: "What's your view on how the Constitution should be interpreted?" Right off the bat, Clinton and Trump gave the wrong answers. Clinton announced that the Supreme Court needs to "stand on the side of the American people," and then rattled off a checklist of political causes and positions she expects the court to endorse: "women's rights . . . rights of the LGBT community. . . no to Citizens United. . . not reverse marriage equality. . . not reverse Roe v. Wade." There was nothing in her answer about how the Constitution should be interpreted, because constitutional interpretation is of no importance to her campaign. What matters to Clinton is that the court deliver the results favored by her most ardent supporters ("I will defend Planned Parenthood. I will defend Roe v. Wade"). Characteristically, his first words were about not what he thinks of the Supreme Court, but what the Supreme Court thinks of him. "Recently, Justice Ginsburg made some very inappropriate statements toward me and toward. . . many millions of people that I represent, and she was forced to apologize." Then he, too, moved to stroke his base: "The justices that I'm going to appoint will be pro-life. They will have a conservative bent. They will be protecting the Second Amendment." Once it was considered inappropriate for presidential candidates to talk about subjecting Supreme Court nominees to litmus tests on controversies that might come before them. Nominees at least paid lip service to the ideal of choosing justices on the basis of jurisprudence, legal philosophy, and fidelity to the Constitution. But now, every presidential election is described, with panicky hyperventilation, as "the most important in our lifetime," because the winner will choose jurists who may shift the court's ideological balance. So Trump's priority will be to name justices who think well of him. Clinton's — to choose justices likely to vote for the Democratic agenda. 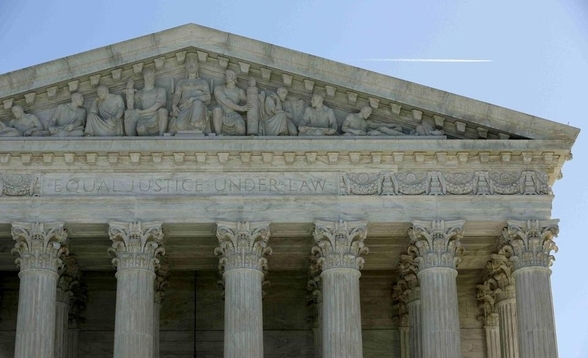 As for the Constitution, its priority is chiseled in marble above the entrance to the Supreme Court: "Equal Justice Under Law." If only Clinton or Trump cared about that.